I’m not usually a fan of Vinho Verde, which translates as “green wine,” so-called because it’s typically consumed very young. Portugal’s famous low-alcohol, semi-sparkling wine usually tastes too tart for me. It’s been years since I’ve bought a bottle of the stuff. But my dry spell finally came to an end when I came across a bottle of 2011 Vera Vinho Verde at Binny’s. It’s not white (or green) at all — it’s rosé. A semi-sparkling Portuguese rosé might bring back memories of Mateus, but this wine from the northerly Minho region looks nothing like that mass-market precursor to White Zinfandel. Though called “rosé,” the Vera’s cherry-red color could barely qualify as pink. A red Vinho Verde? And with 11.5% alcohol, no less? I was most intrigued, and I snapped it up. There’s a reason I had never seen a red Vinho Verde on the shelves before. 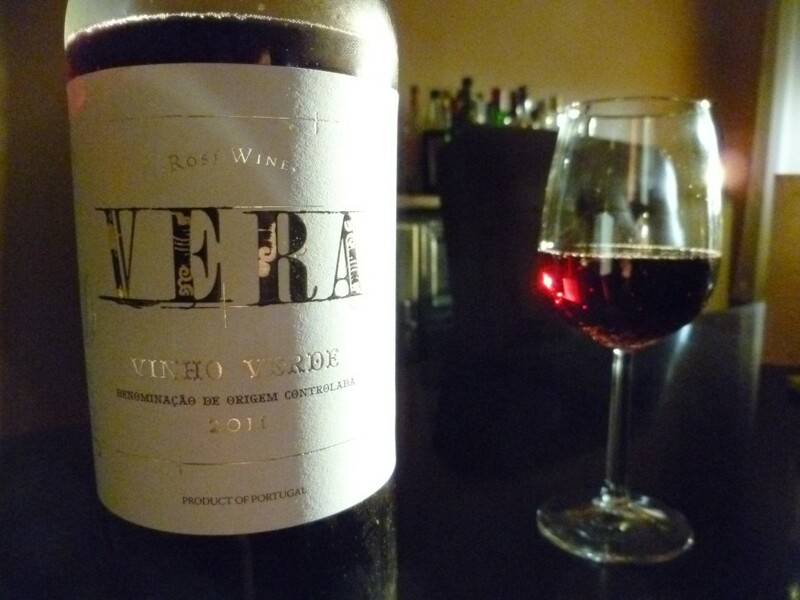 According to The Oxford Companion to Wine, “Foreign palates struggle with these deep-coloured, rasping reds, and although it is still prized locally, little red Vinho Verde leaves the north of Portugal.” I suspect foreign marketers also struggle with varieties such as Vinhão and Rabo de Anho, which make up 60% and 40% of the Vera, respectively. But the Vera label declares that Rabo de Anho “does not translate at all,” and it may be right. I can find precious little about this variety, the first variety I’ve encountered which doesn’t have an entry in the Companion. According to Wikipedia, it shouldn’t be confused with the white-skinned Rabo de Ovelha, a variety the Companion also notes as white. But the website vinhoverde.pt regards Rabo de Anho and Rabo de Ovelha as synonyms. So I don’t know what the heck is going on.